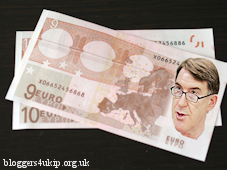 Peter Mandelson (I won't call him Lord Mandelson, a man without honour doesn't deserve an honourary title) says that the UK will join the Euro. Nobody in their right mind would willingly abandon the pound and adopt a currency that's run by and for France and Germany. But then Mandy isn't in his right mind, not by a long shot. The man's an utter fruitcake - like most eurofederalists his mind doesn't inhabit the same planet his body does. Of course, Mandy's suggestion that we should adopt the Euro might have something to do with the fact that he risks losing his very generous taxpayer-funded EU pension if he fails to promote the European Empire. Mandelson serves two masters - the British government and the European Empire. So where does his loyalty lie and who does he love and hate? I think we all know the answer to that question. Oh come off it, it isn't going to happen, they're struggling to keep the existing Euro-zone together (i.e. a system whereby Germany and The Netherlands bail out the rest of them, primarily France). They don't even have room for us on their sinking ship, even if we wanted to join (which we don't). "Having been appointed as a member of the Commission of the European Communities by the Council of the European Union, after the vote of approval by the European Parliament, I do solemnly undertake: to be completely independent in the performance of my duties, in the general interest of the Communities; in the performance of these duties, neither to seek nor to take instructions from any government or from any other body; to refrain from any action incompatible with my duties. I further undertake to respect, both during and after my term of office, the obligations arising therefrom and in particular, the duty to behave with integrity and discretion as regards the acceptance after I have ceased to hold office of certain appointments or benefits." Interesting, the undertaking continues after his time as commissioner. Nobody in their right mind would willingly abandon the pound and adopt a currency that’s run by and for France and Germany. I think Mark is right here but the worry is that they'll try to ram it through the moment Irish Lisbon 2 is passed. Why didn't he say this before 4th June? Shame. Do you expect the Conservatives to win a working majority at the next election? I do. In which case does it matter what Peter Mandelson thinks? It's not as if there is enough time for Labour to bring in the Euro. What matters is what Cameron thinks he can get away with. Given significant opinion within his party, and UKIP's support, I think the Euro is a step too far for him to seriously consider ... at present. Peter Mandelson is not on the side of Gordon Brown. He is on his own side with his own agenda. If Gordon Brown resigns and a new person takes over, there will have to be an election soon after. The Conservatives are certain to win that election. The Conservatives would then hold a referendum on the Lisbon Treaty. If the Lisbon Treaty is not ratified by Britain it cannot take effect elsewhere is Europe. This what Peter Mandelson is supporting. He wants to keep in power a Prime Minister that supports the Lisbon Treaty. This has nothing to do with liking Gordon Brown.